The staccato ordering will be followed by an impatient hum as individuals wait for everything to arrive and the pot to soup to come to life with the bubbling steam. At Morals Villages, they run as a well-oiled machine. 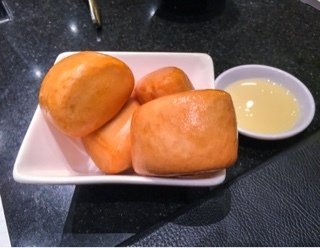 On both visits, as soon as all guests arrived our order was quickly taken, pots whisked out shortly thereafter and given their personal sizes didn’t take long to reach cooking temperature. 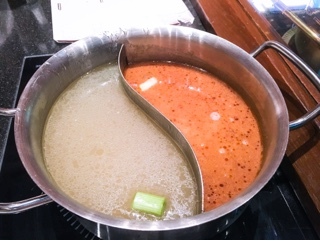 With eleven soup bases ($2.50 - $8), some with three levels of spiciness and the split feature ($3.50 for two choices), deciding can be difficult. Personally, I prefer the neutral ones (such as chicken broth) given you can always add flavours through the plethora of sauces. 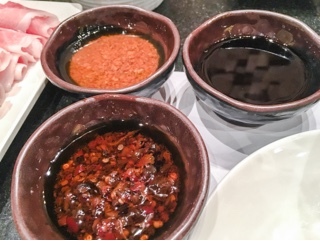 Which leads me to the varied tastes you’ll experience: the metallic tang from the quickly poached beef; the saltiness of the soy, nuttiness of the sesame paste or spiciness of the sha cha sauce; and you can’t forget the wonderful unami essence of the soup after all the ingredients meld together. Weekday pricing at Morals is as follows: $25.99 for adults, $19.95 for seniors and $13.95 for those under 13. An extra $2 per person is charged for weekends and holidays. Of course, you also have to add on the price of the soup. Additionally, there are tons of upgrades such as an extra $3/person to switch from regular rib eye slices to the Angus short rib. 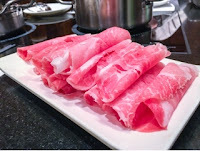 Having tried both you can taste the difference from the short rib – the meat more flavourful especially with the ribbon of thin lard running throughout. Yet, it’s not astronomically changed so the regular rib eye tastes perfectly delicious. For those who really want a feast there are luxury ingredients sold individually such as Alaska snow crab legs ($19 for 8), abalone ($6 each) or fresh oysters ($3 each). 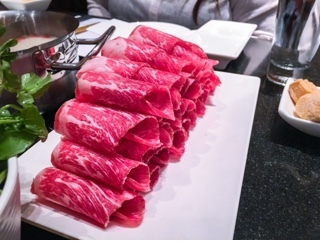 The “deal” would be their special platter ($9), which consists of 5 slices of wagyu short rib, 5 slices of Kagoshima pork and 6 tiger shrimp skewers. Even the tablescapes at Moral are a sight to behold - the wonderful contrast from the soups and ingredients popping against the black background (see title photo). 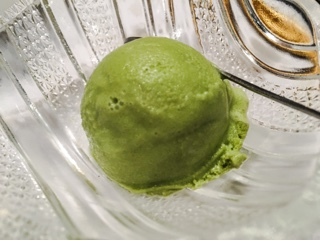 There’s also the lovely hues from Morals limited dessert menu: green tea ice cream or golden deep fried buns with creamy condensed milk for dipping. However, the experience is best described by how you feel at the end: the warm fullness that hugs your body or the dewy glow on the skin from the free facial that occurs throughout the meal. For me, it’s the memories of past experiences that’s the most precious. 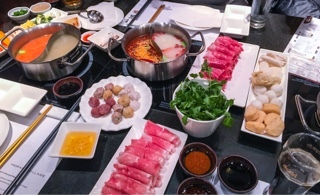 Inevitably, it’s my first hot pot encounter that’s the most vivid: seated around the kitchen table with just my parents and immersing food into a simple bone broth. There wasn’t a hundred ingredients to choose from yet the dozen we laid out already seemed like a lot. Indeed, the large shared electric red pot took much longer to heat up than the quick mini induction ones at Morals. 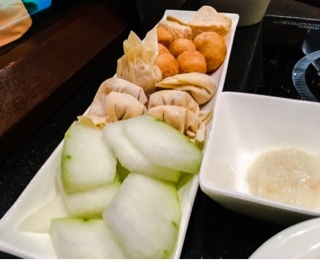 The laid back pace of hot pot makes me remember something that holds true for all dining experiences - it’s not necessarily about what you eat, but who you share it with.